A Massive Ordnance Air Blast bomb, or MOAB, the largest conventional bomb in the U.S. weapons arsenal, is prepared for testing at Eglin Air Force Base, Florida, March 11, 2003.
military and intelligence effort to discourage and demoralize enemy forces. Upon detonation, MOAB produces a mushroom cloud similar to a nuclear blast. The MOAB bomb is the most powerful non-nuclear weapon in the U.S. arsenal. 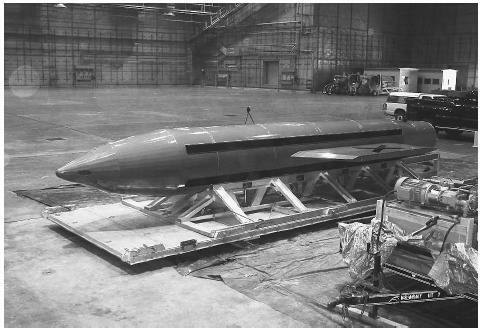 At 21,000 pounds, the MOAB bomb is 6,000 pounds heavier than the next largest conventional bomb, the BLU-82 (nicknamed the "Daisy Cutter") bomb used in Vietnam. Like the BLU-82, the MOAB is a fuel air disbursement bomb. In Vietnam the large blast from the BLU-82 was used to create instant landing zones for helicopters. Although both the BLU-82 and MOAB are dropped from a B-52 or an MC-130 cargo plane flown by Air Force Special Operations Forces, the MOAB has a GPS based satellite guidance system to enhance accuracy. The BLU-82 has an estimated target error allowance of several hundred feet. In contrast, the MOAB was designed to guide to within one meter of its intended detonation point. This accuracy was important to planners in carefully calculating the radius of the fireball and destructive blast from MOAB. Fuel air explosives are designed to explode above the ground, disperse aerosolized fuel, and then detonate the highly volatile fuel-air mixture. The concussive detonation produces a violent shock wave. BLU-82 bombs proved useful in attacking cave complexes in Afghanistan containing Taliban and Al Qaeda terrorists because the violent blast—in addition to its direct destructive force—also deprives those under the blast of oxygen. The power of the blast is intended not only to kill and destroy—but also to shock and demoralize enemy troops. Discussing the bomb in March of 2003, Defense Secretary Donald H. Rumsfeld acknowledged the Pentagon's plans to use MOAB to shock enemy troops in the impending war with Iraq and asserted, "There is a psychological component to all aspects of warfare." Potential use of MOAB was incorporated by military planners into U.S. "shock and awe" tactical doctrine that calls for swift and intense military attacks to disorient enemy troops. The United States Air Force conducted a demonstration test of the MOAB at Eglin Air Force Base near Pensacola, Florida, on March 11, 2003. Press coverage was extensive, and within hours of the test the Pentagon released footage of the blast to news services. Pentagon planners hoped that footage would make its way into Iraq and help discourage Iraqi troops from what seemed to be futile resistance against a vastly superior U.S.-led coalition. Shanker, Tom. "Largest Conventional Bomb Dropped in a Test in Florida." New York Times. March 12, 2003.